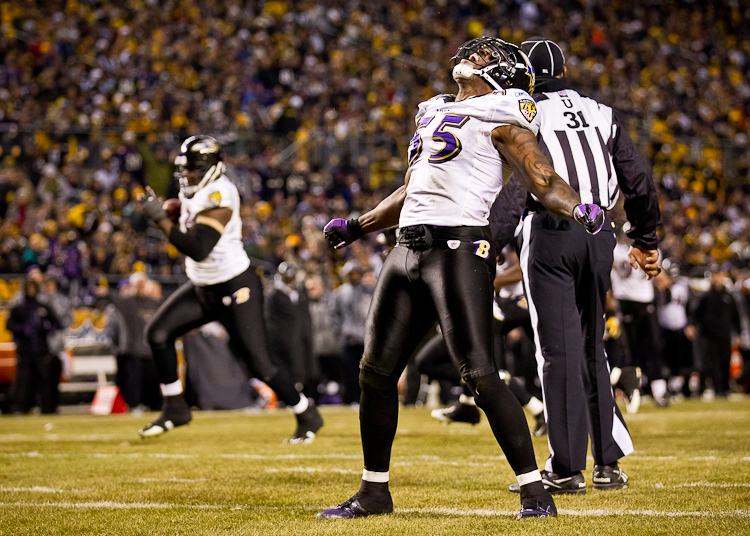 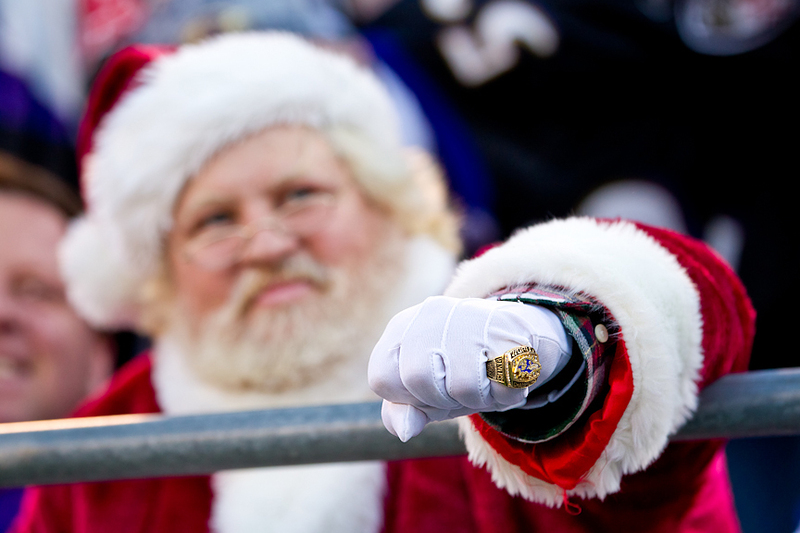 By beating the Cleveland Browns on Christmas Eve, the Ravens went undefeated at M&T Bank Stadium for the first time in franchise history. 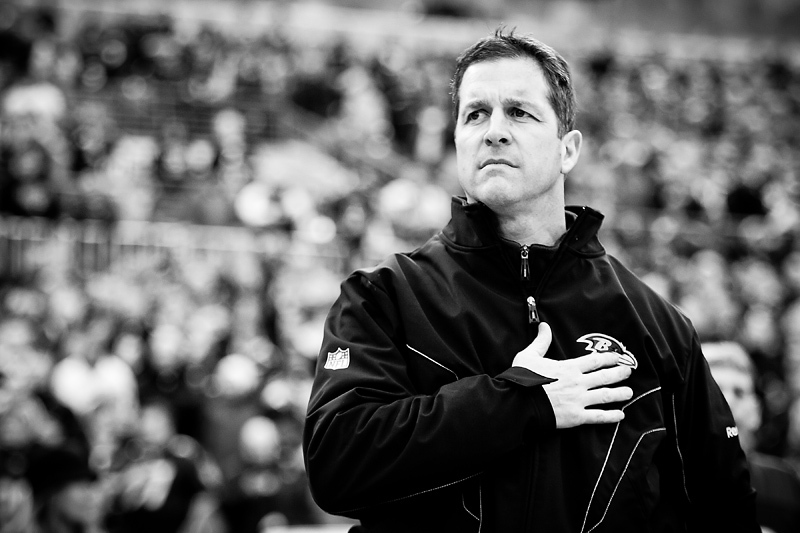 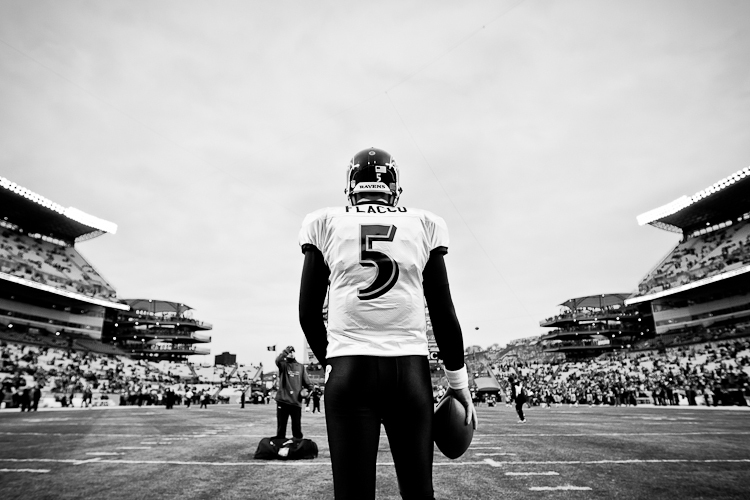 I want to draw a little attention to the fact that the Ravens have won EVERY game which I have photographed this year…I don’t normally travel to regular season away games (except Pittsburgh this year). 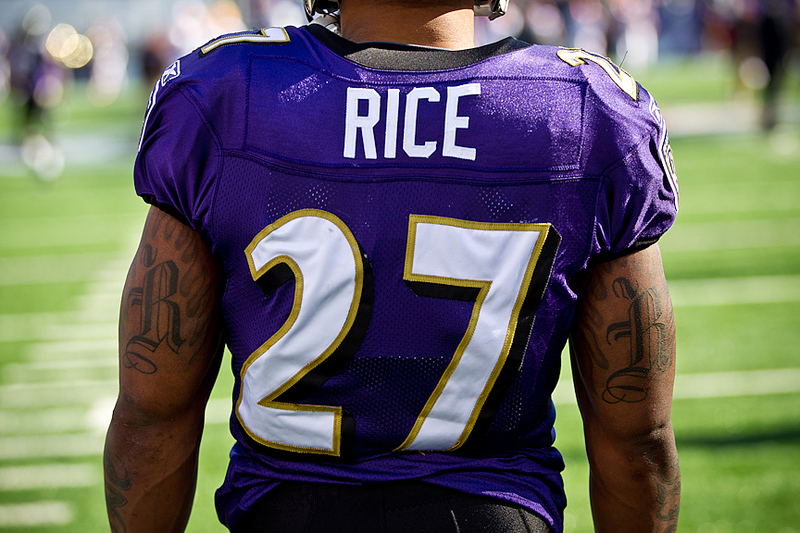 But given this statistic, I’m thinking they might want me around on the road next year. 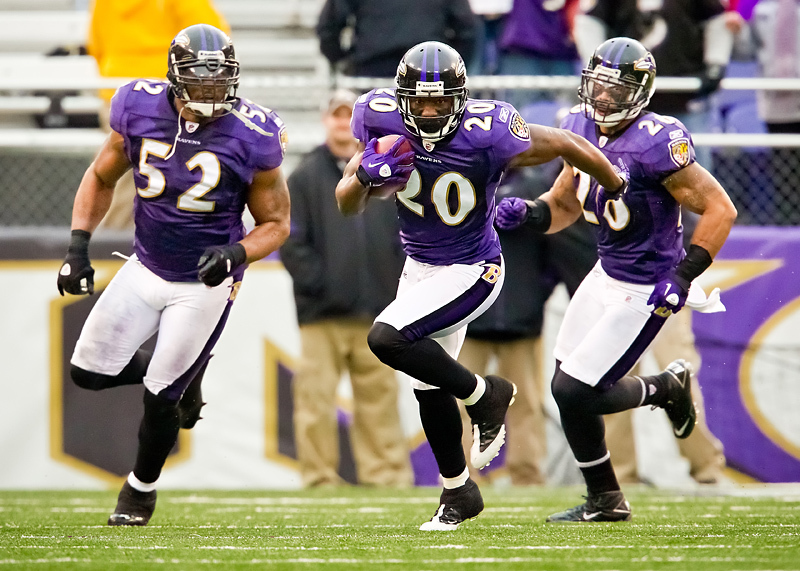 They’ll be on their own in Cincinnati, as I won’t be traveling, however I’ll be around wherever we play in the post season to keep the streak alive. 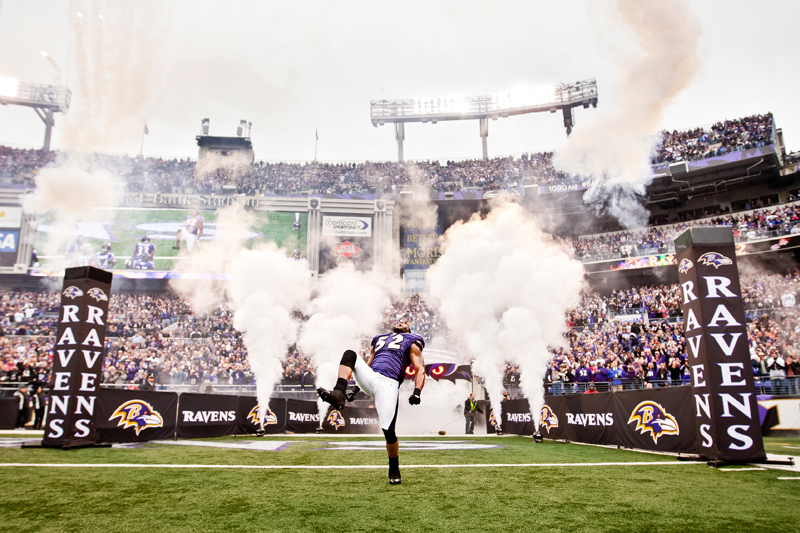 When you walk into Arrowhead stadium in Kansas City, this inside is full of digital banners proclaiming that you are in fact in the “NFL’s loudest stadium.” Through the first two quarters of the Ravens’ divisional playoff game against the Chiefs, you would have thought that was possible. 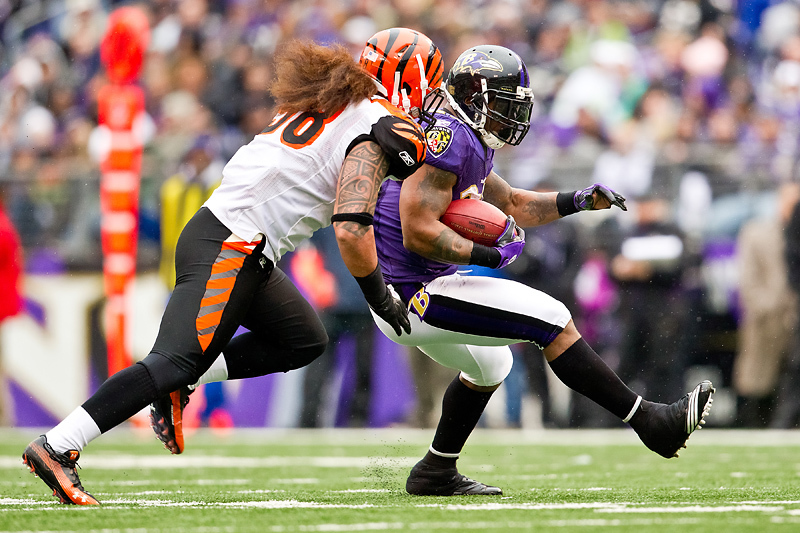 However by the second half, after a few Ravens’ touchdowns and some Chiefs’ turnovers you could here a pin drop. 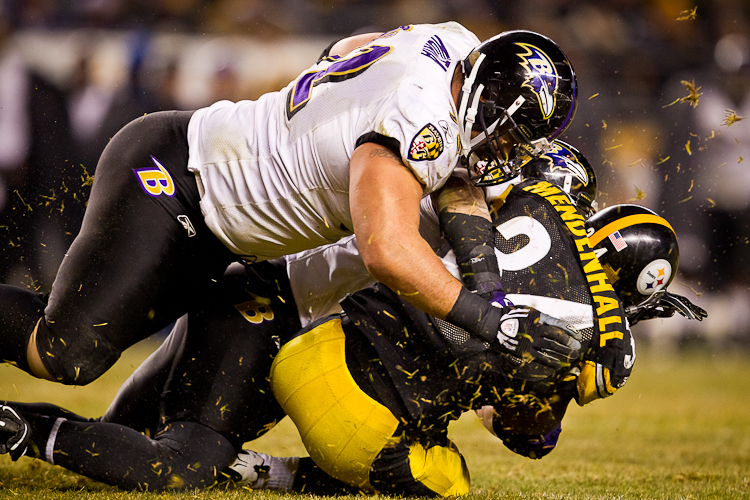 The Ravens played what was most likely their most complete game of the season with big plays on both offense and defense. 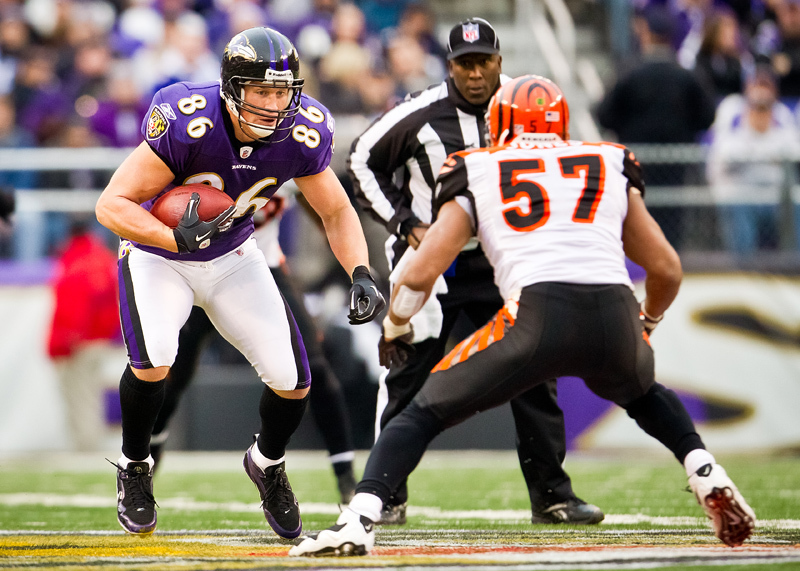 Joe Flacco and Todd Heap had record games and the defense recorded 5 turnovers. 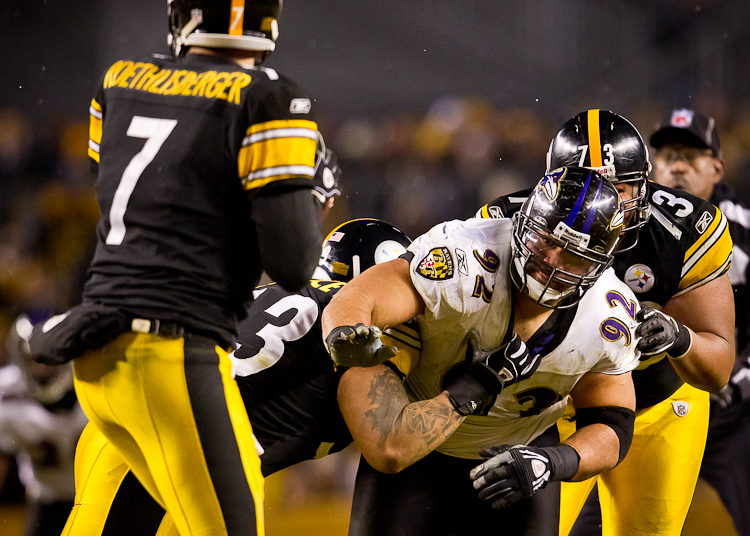 This type of blowout win is exactly what we need as momentum going forward into a very hostile Heinz Field in Pittsburgh next week. 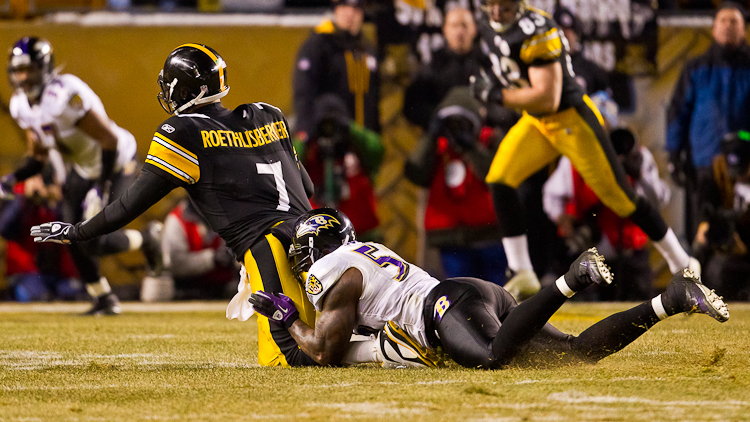 We know what to expect and so do the Steelers. 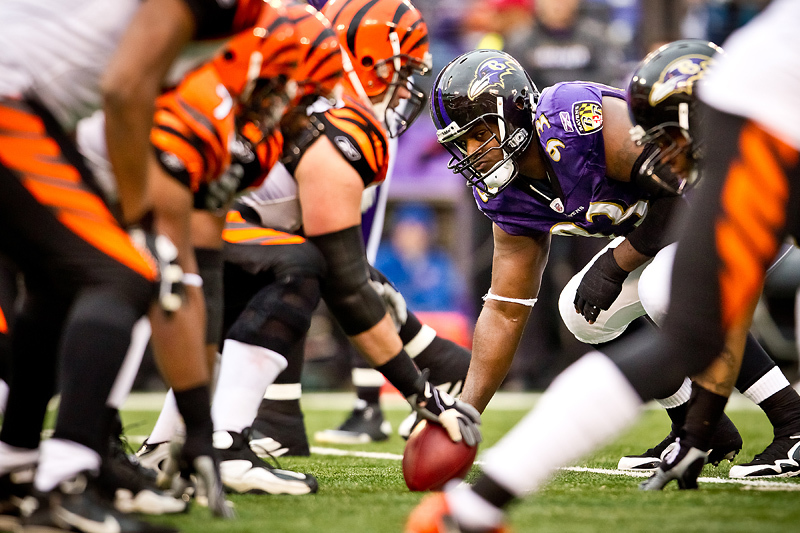 Its going to be a thrilling game. 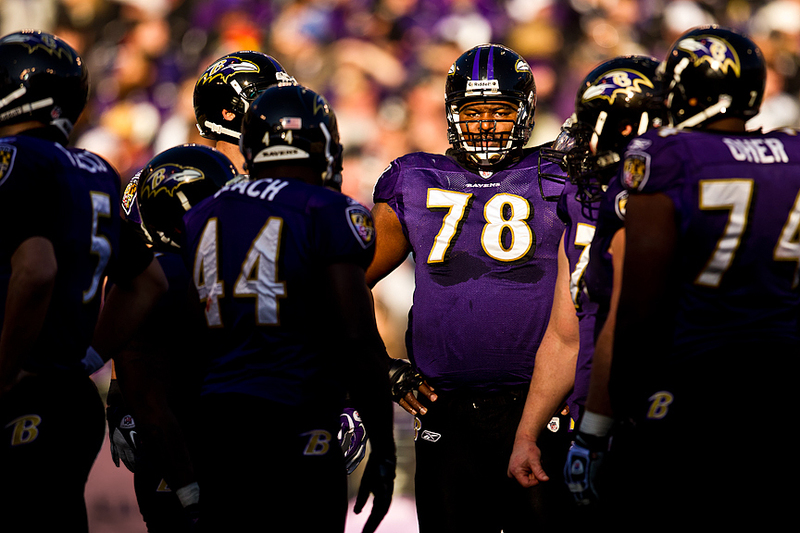 Hopefully the Ravens come out on top. 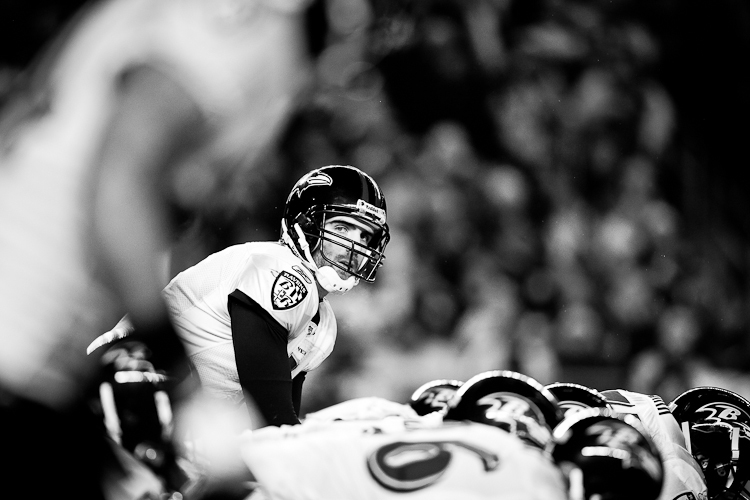 I picked out a few more images than normal just because it was the playoffs…I hope you enjoy them. 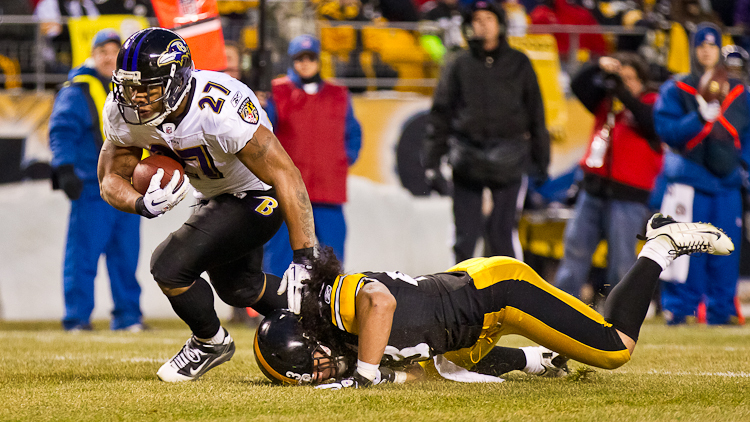 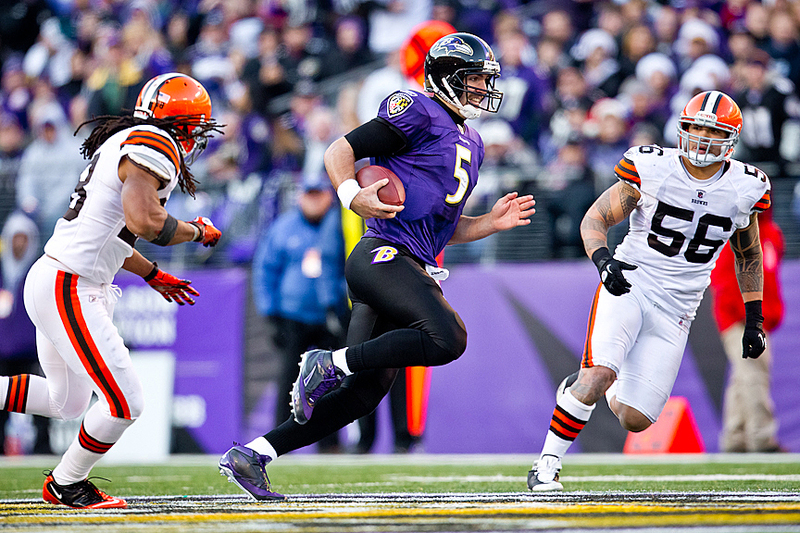 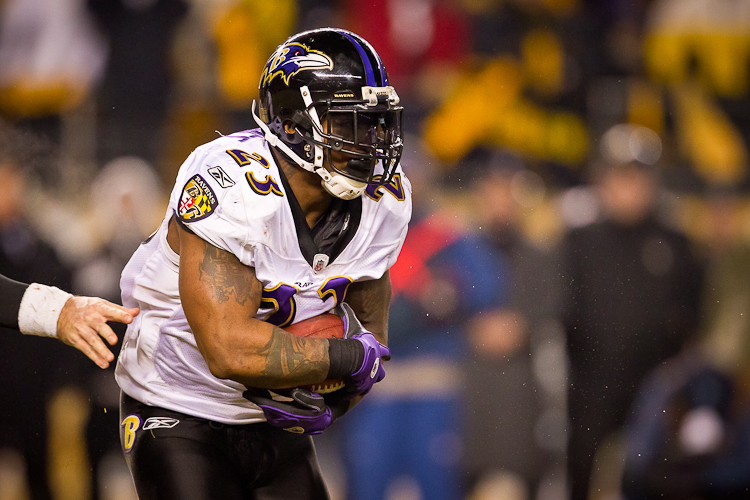 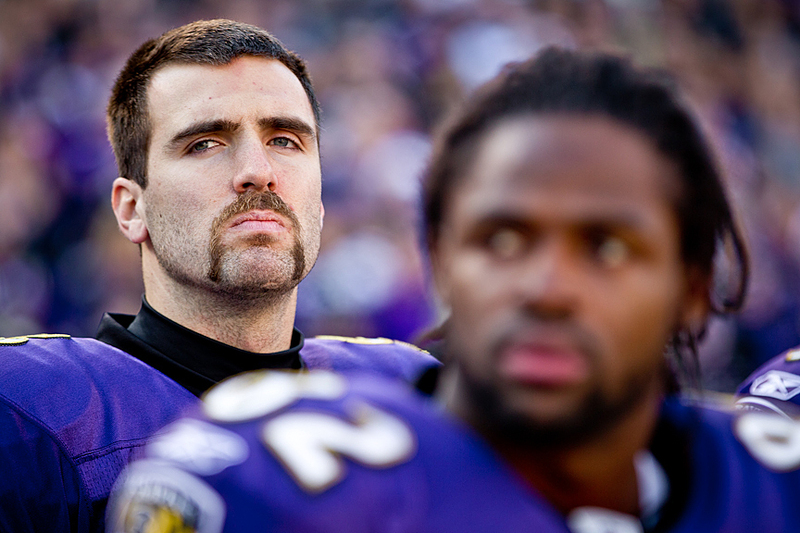 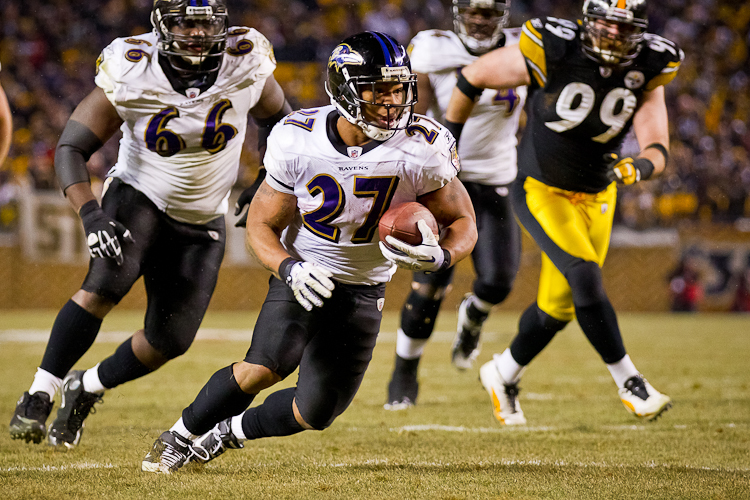 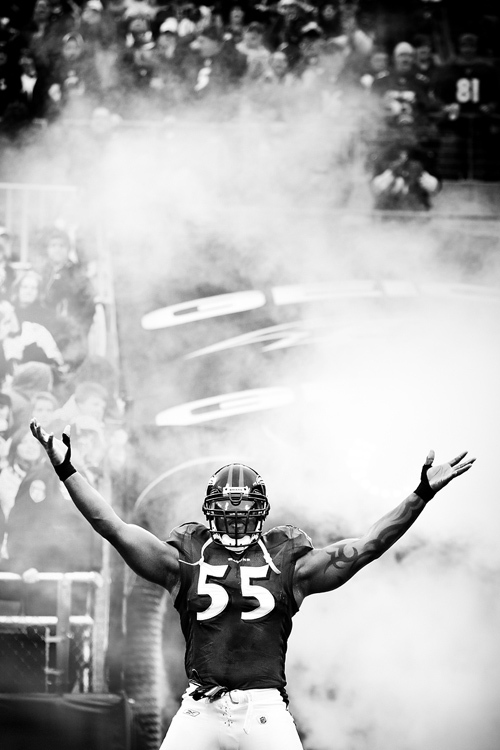 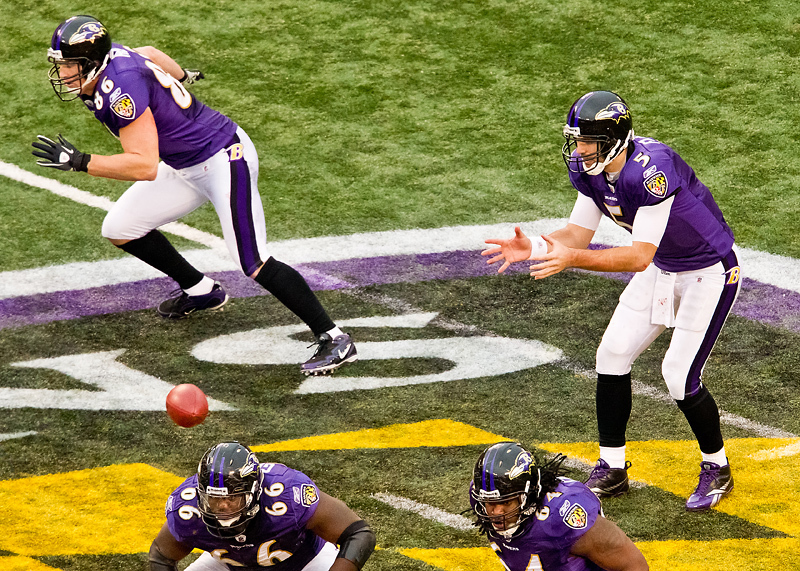 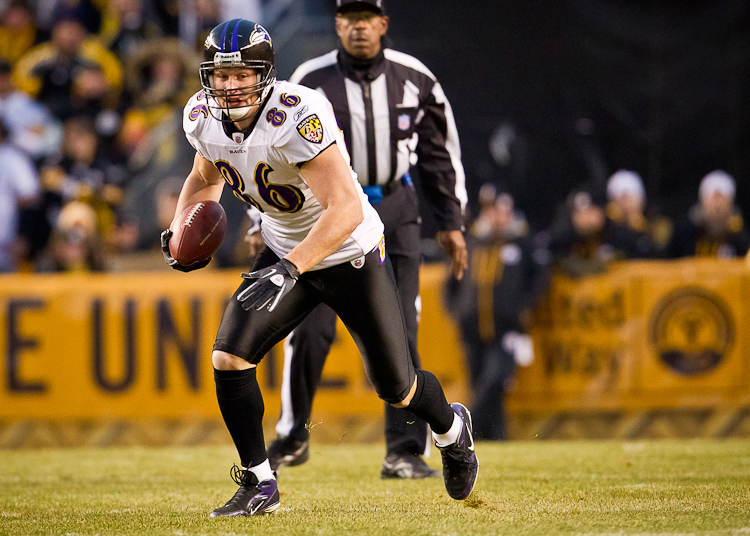 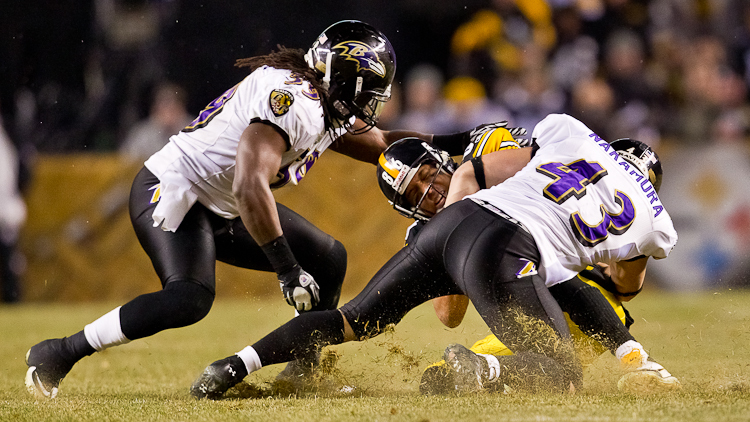 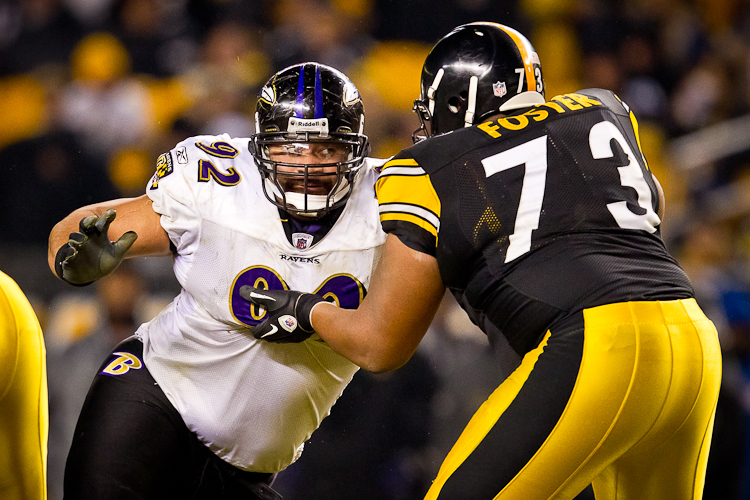 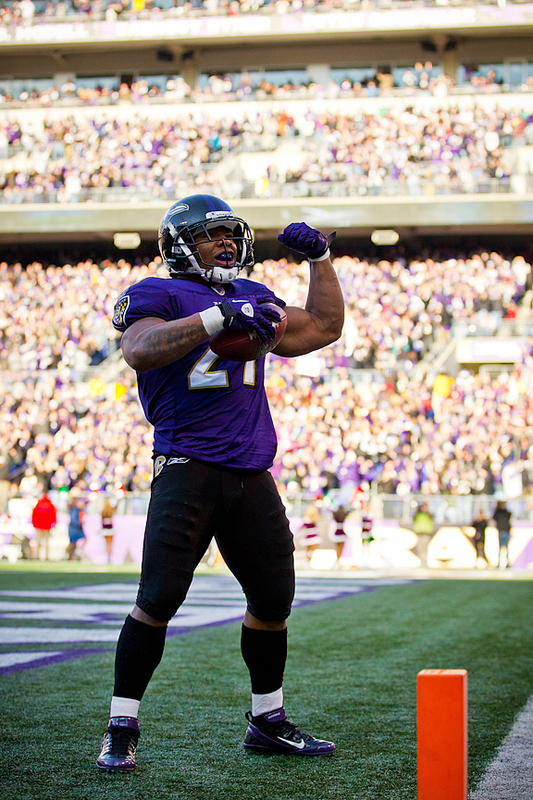 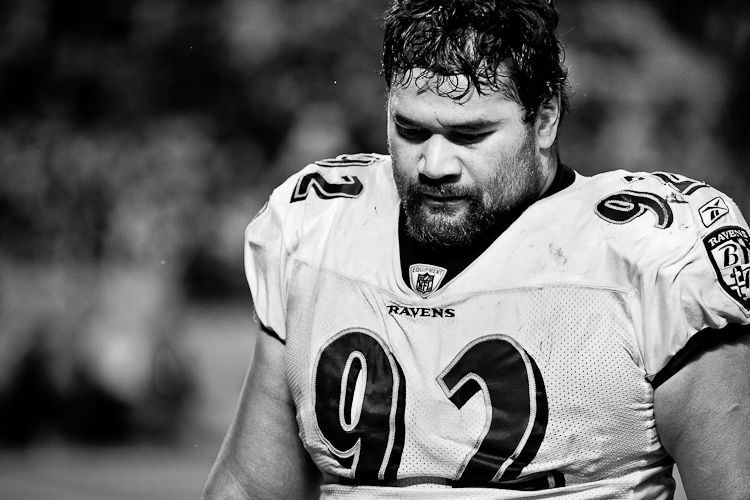 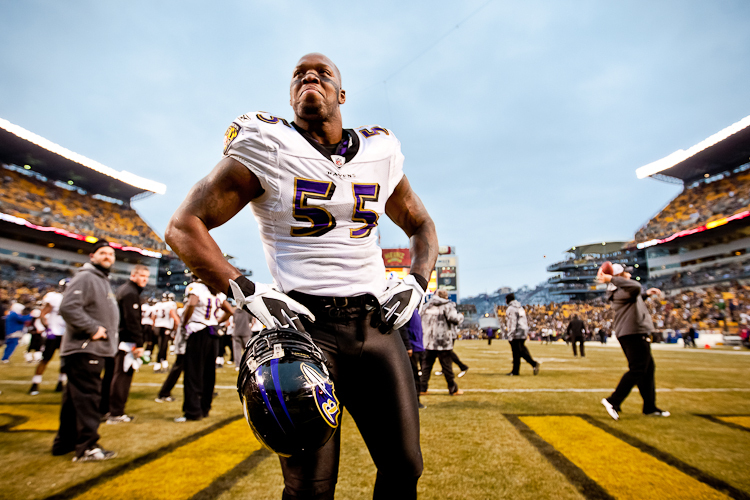 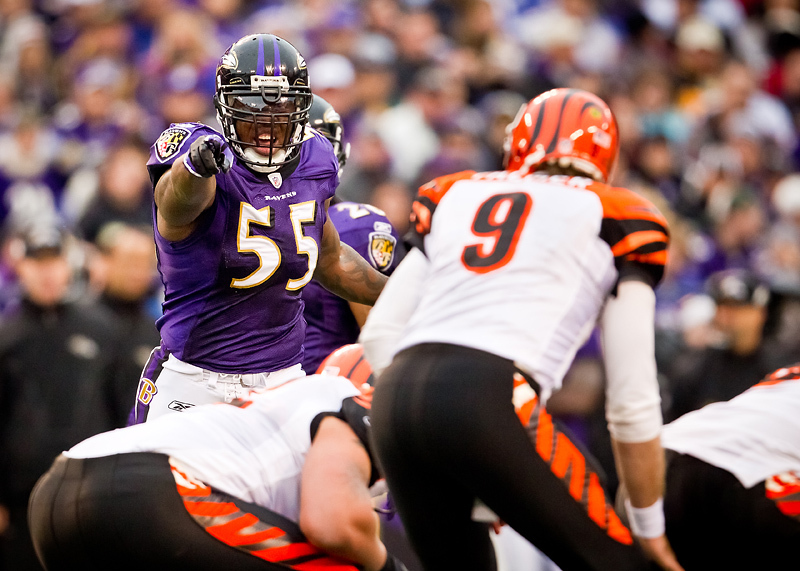 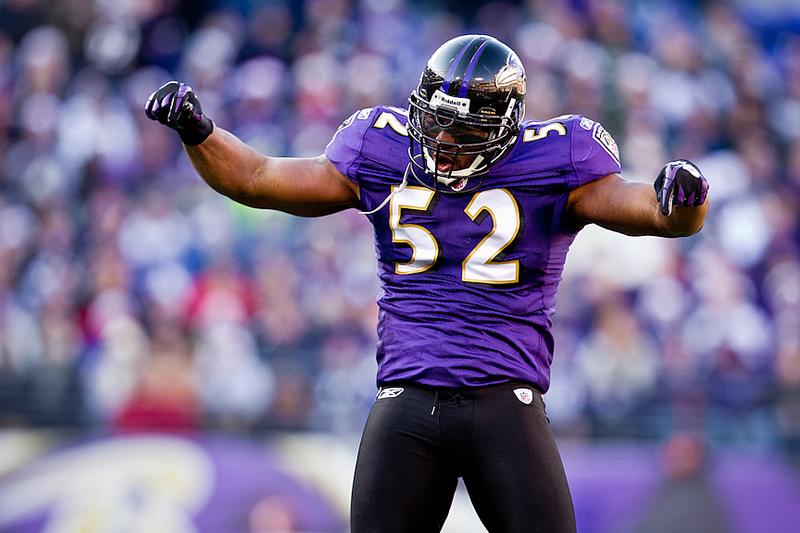 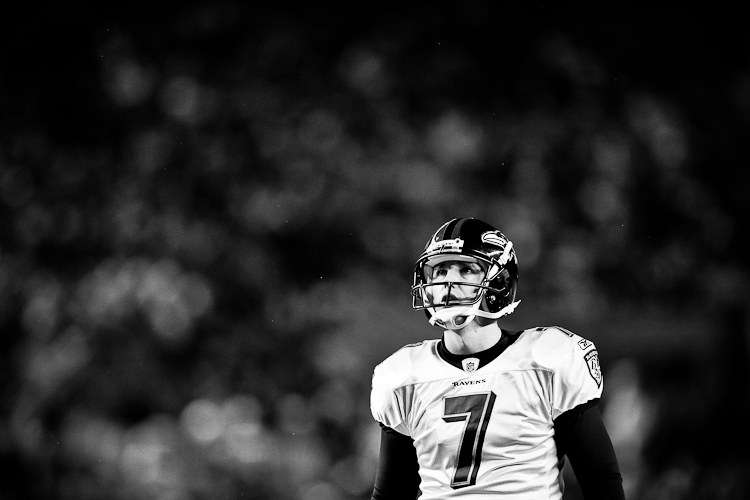 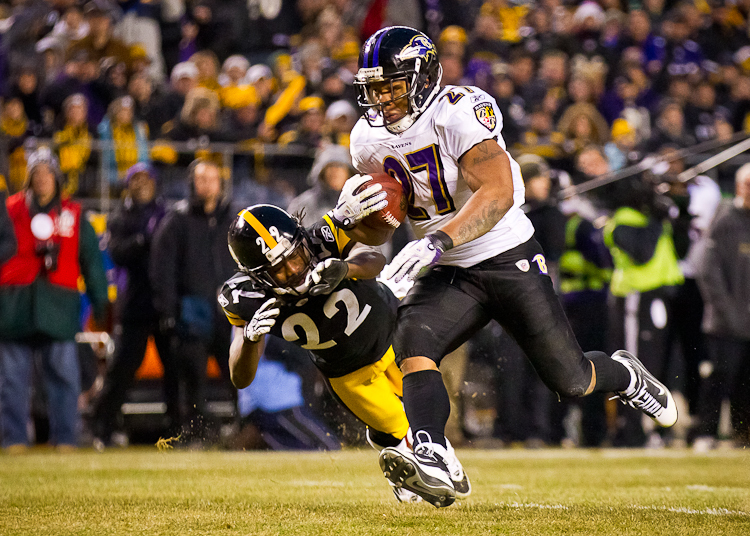 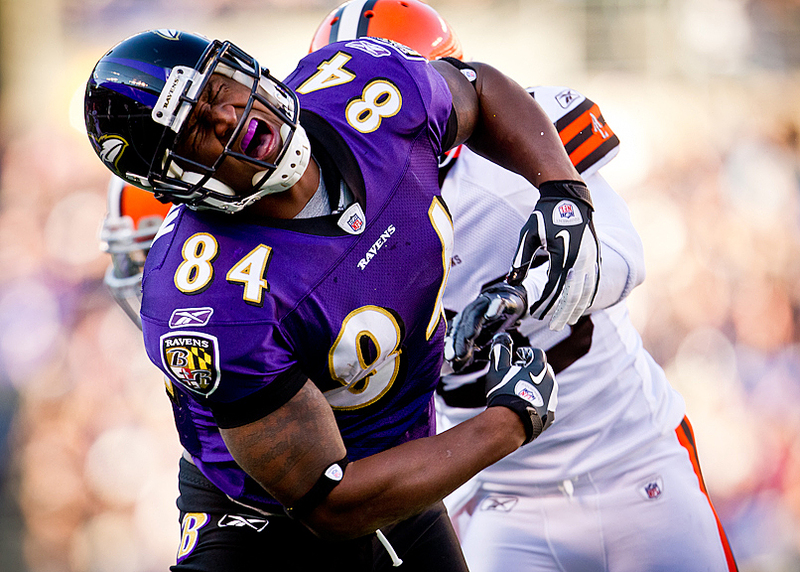 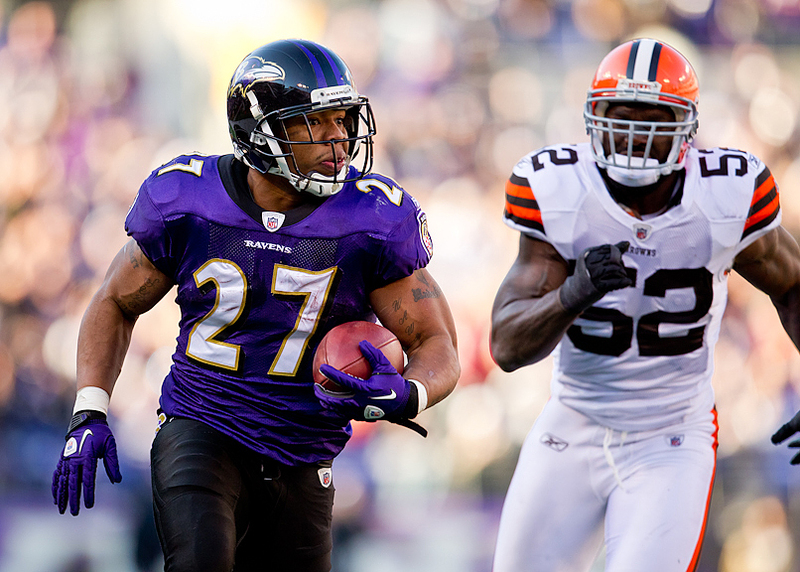 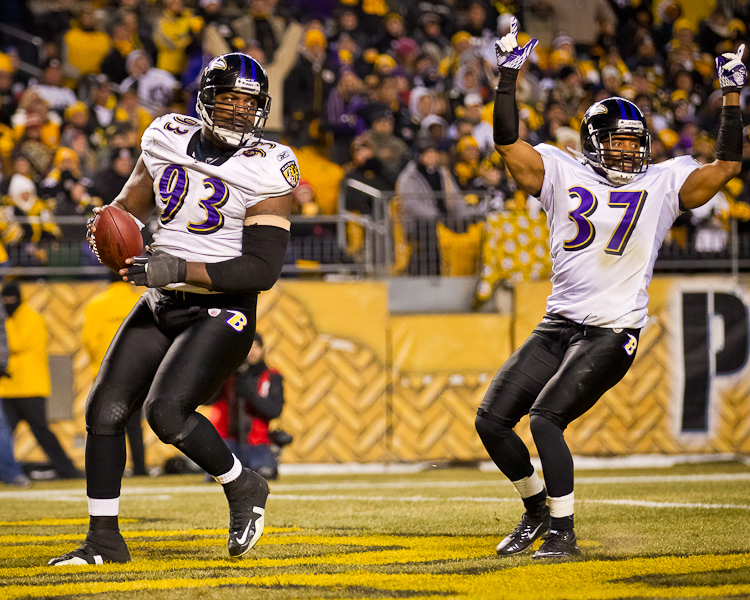 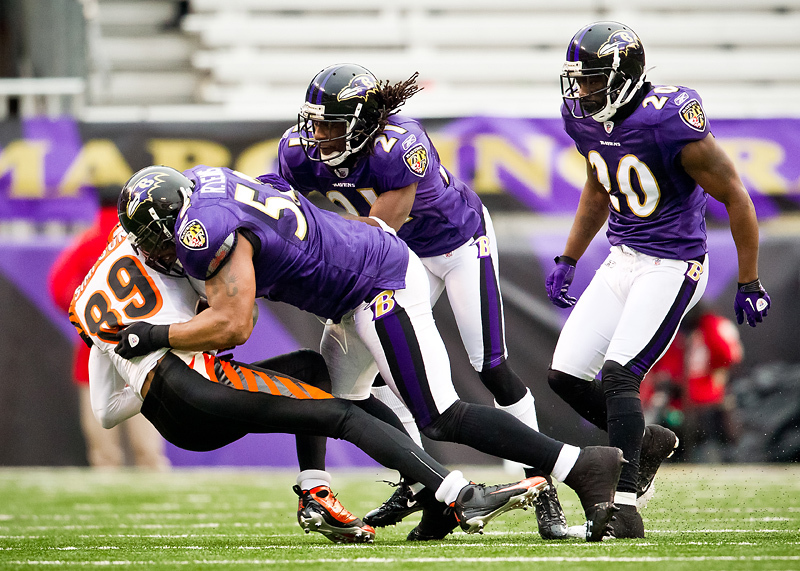 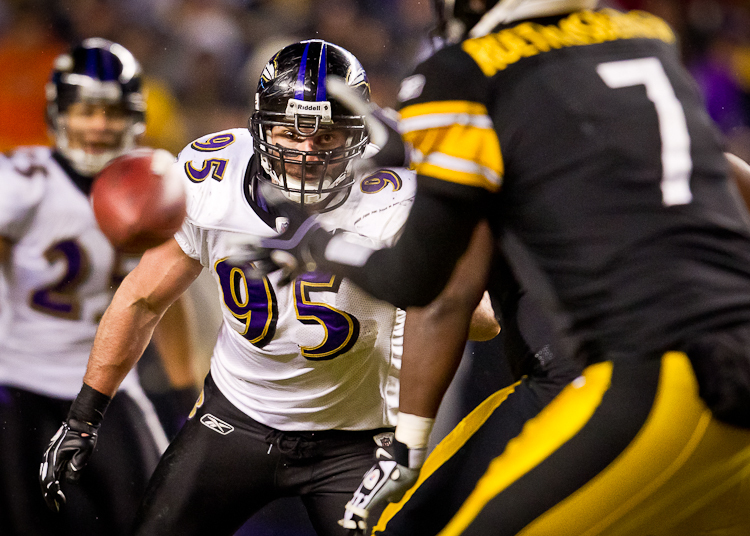 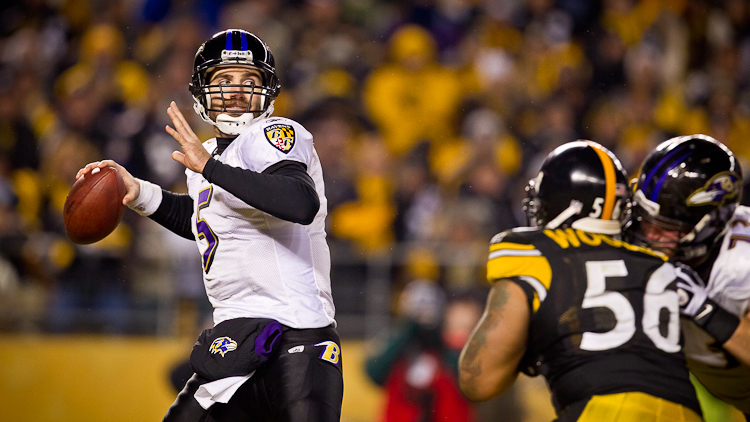 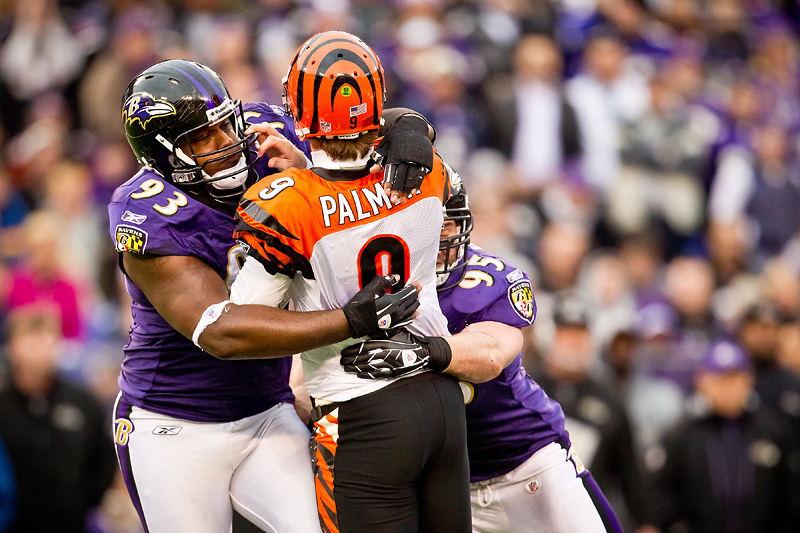 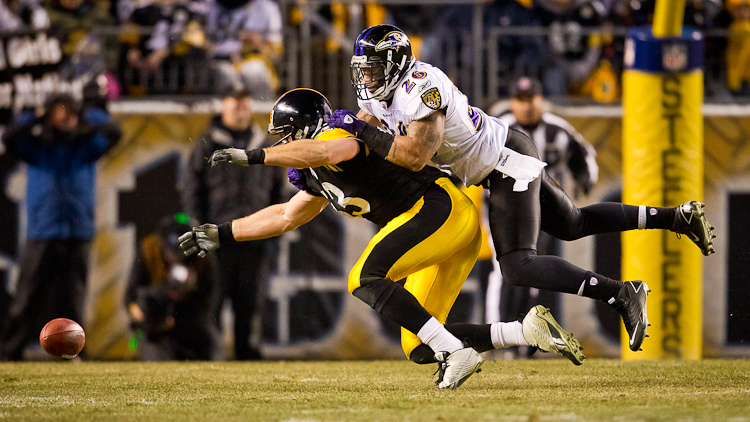 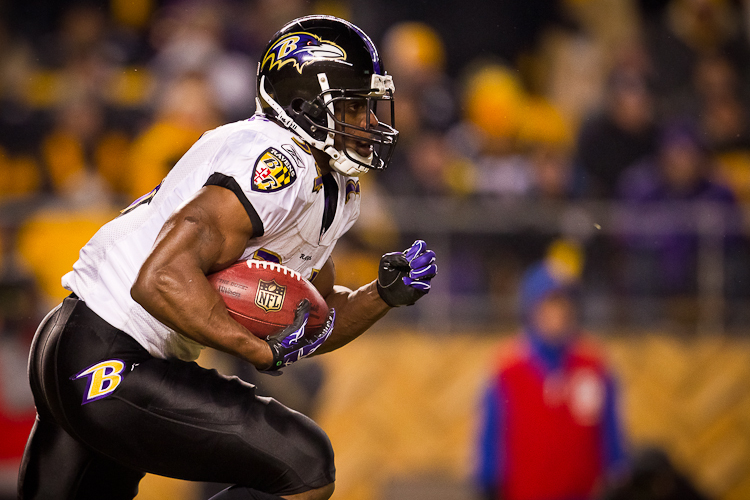 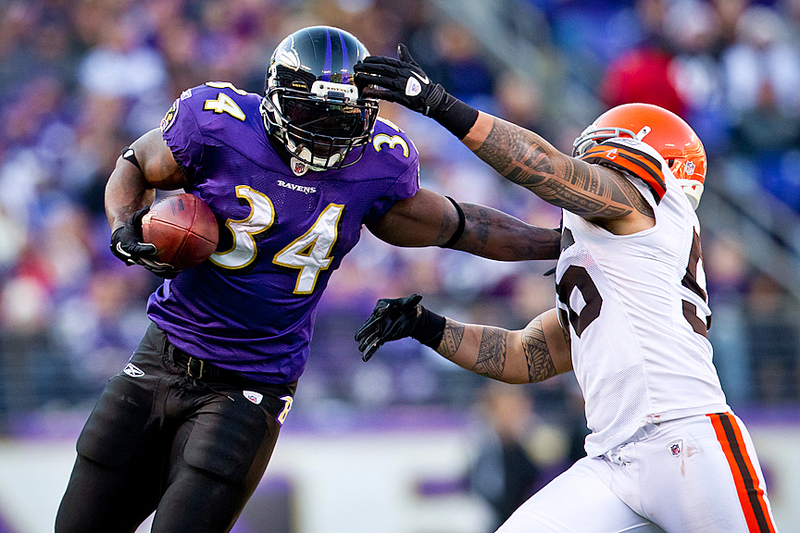 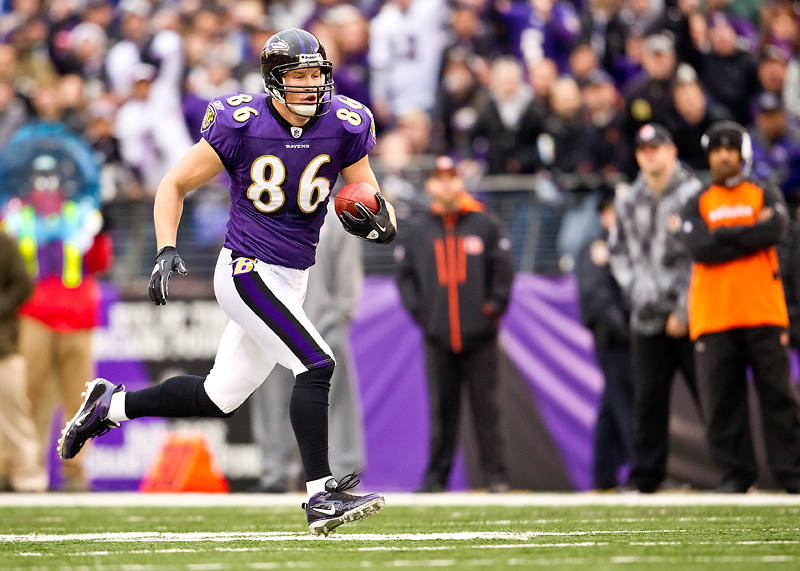 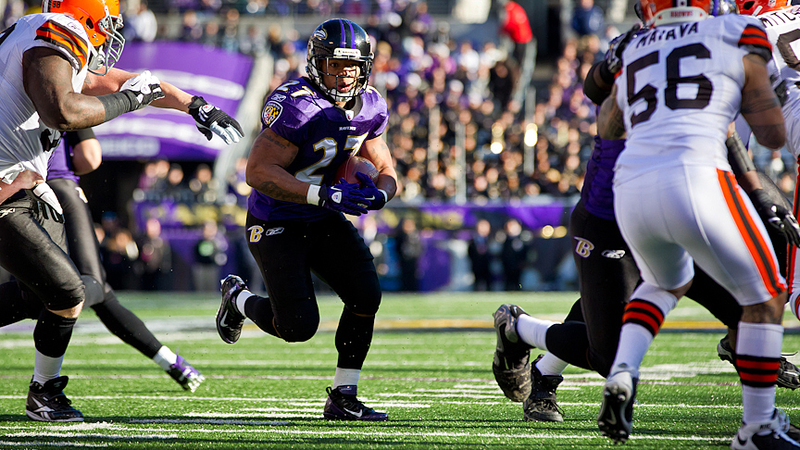 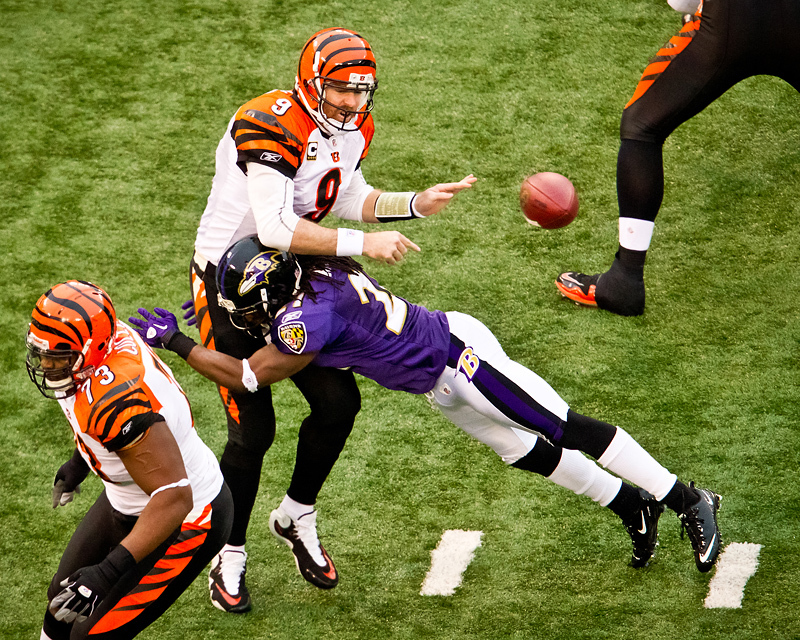 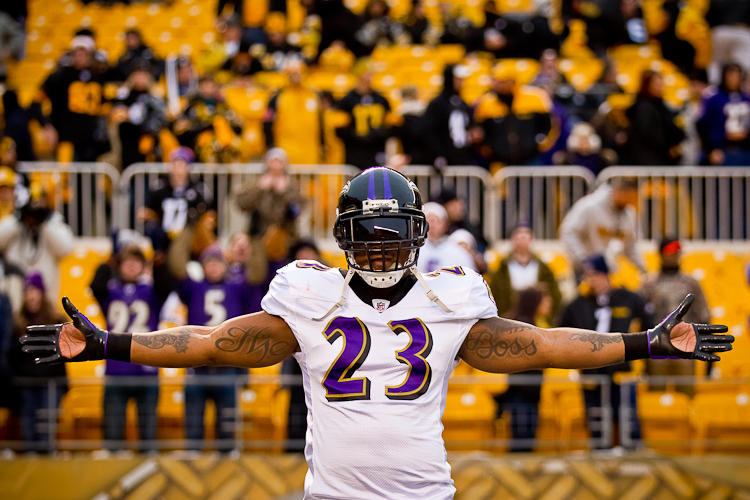 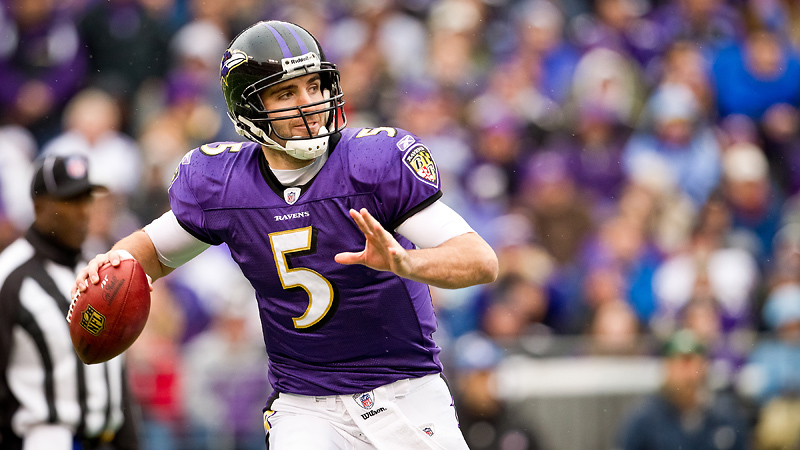 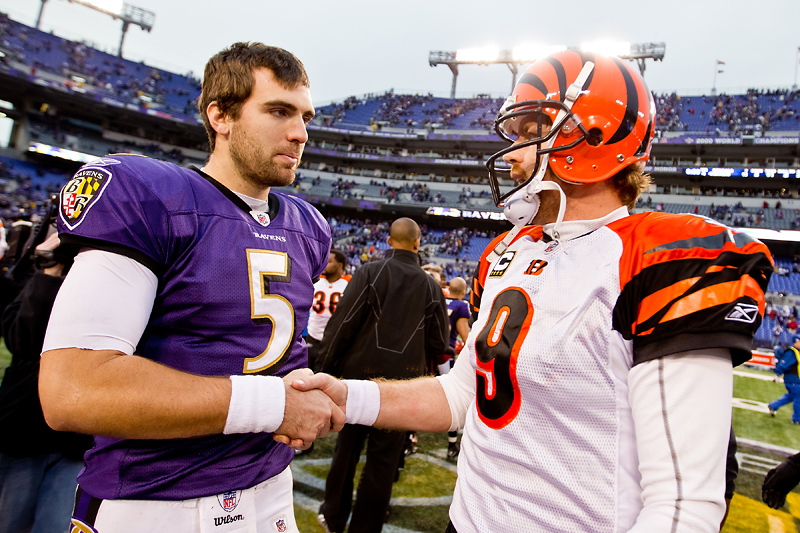 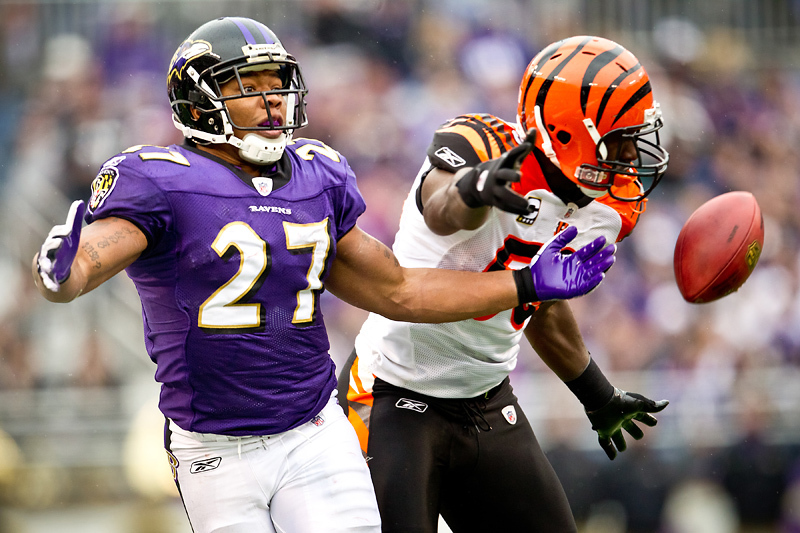 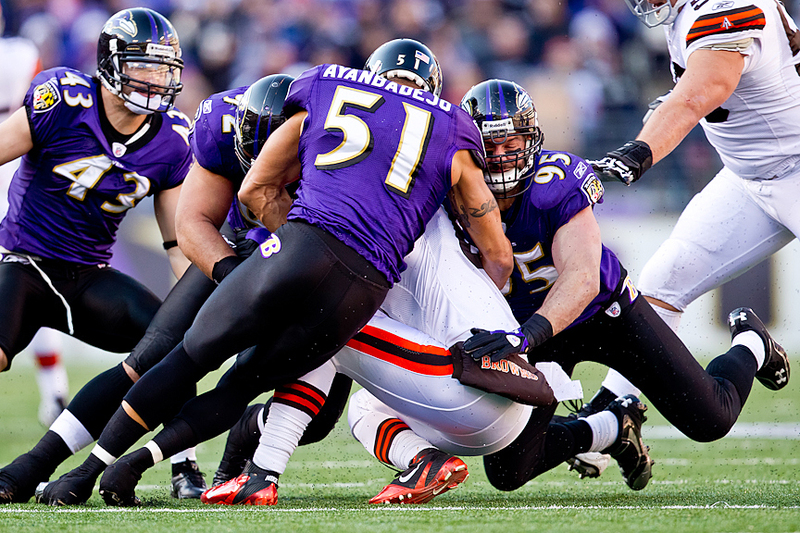 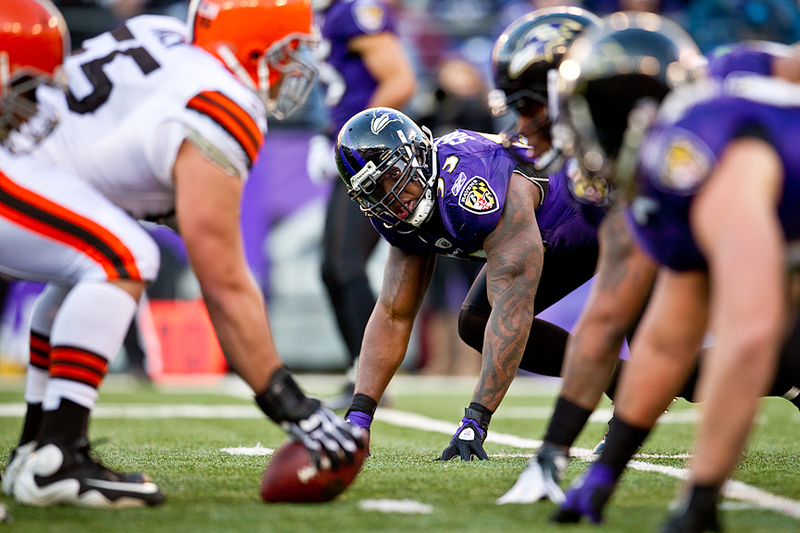 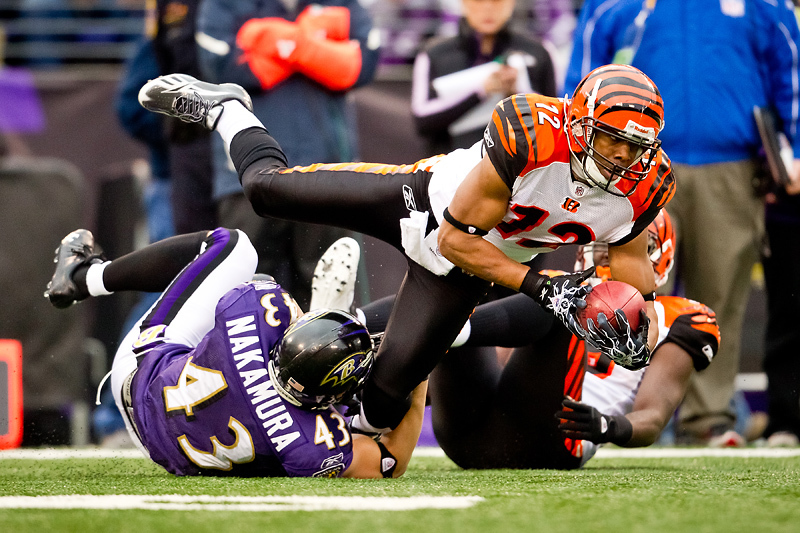 The Ravens snuck out another close win last weekend against the Cincinnati Bengals. 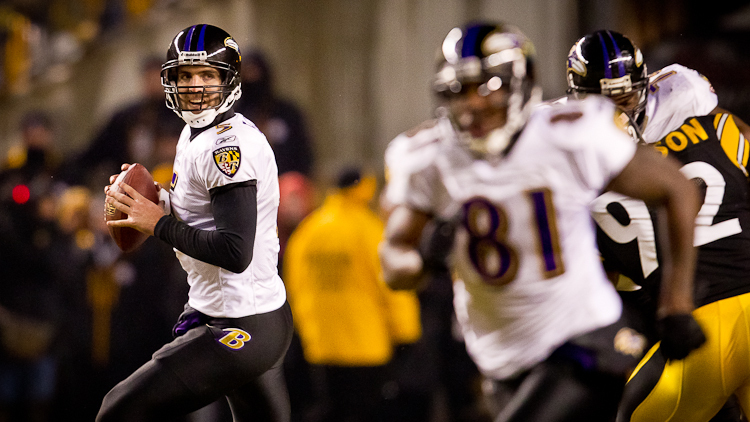 Although they’ll admit they left a lot of points on the field, a win is a win, and the Ravens are in the playoffs for the 3rd straight year…quite an accomplishment. 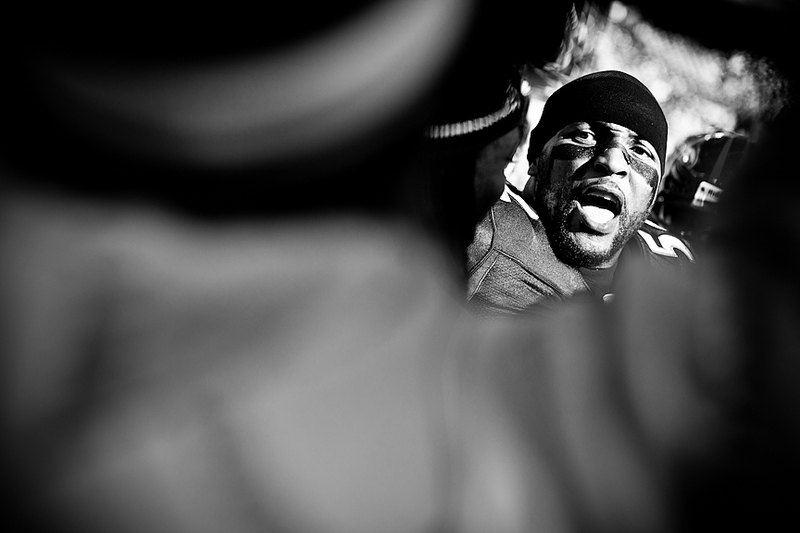 It was an ugly game, which is tough to photograph, but I always have fun on the sidelines. 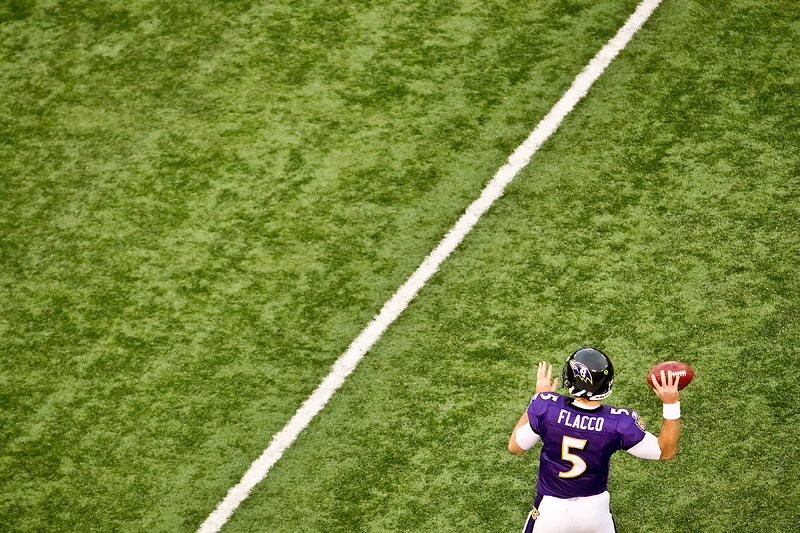 Just so I didn’t get bored, I shot the third quarter from up in the stands. 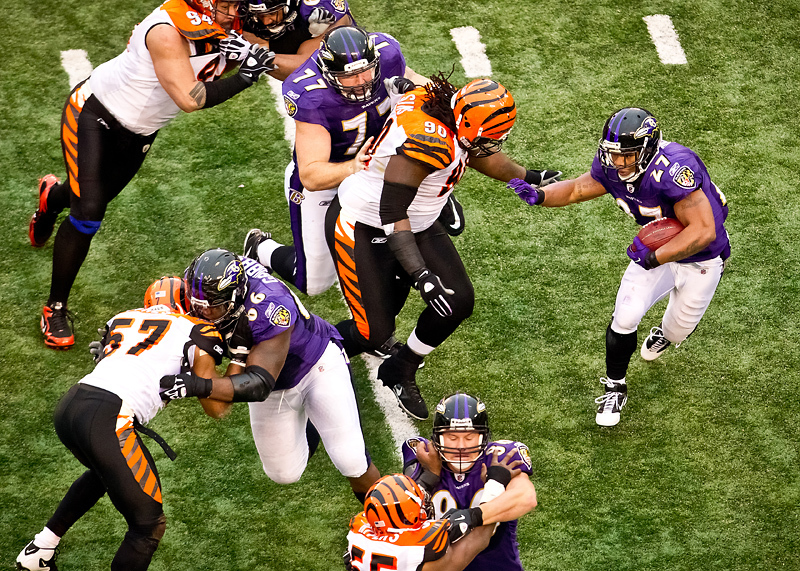 I really like this perspective for football. 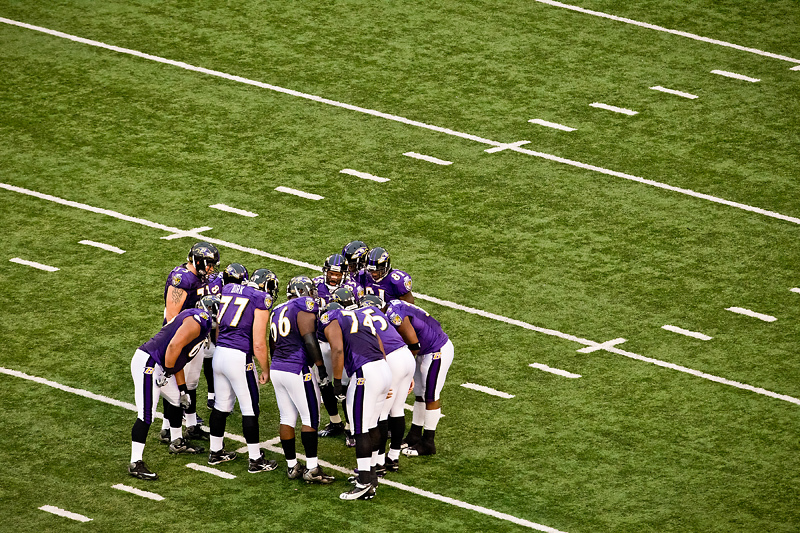 So often, the sidelines are EXTREMELY cluttered with team personnel, photographers, cheerleaders, security guards and other random people getting in my way. 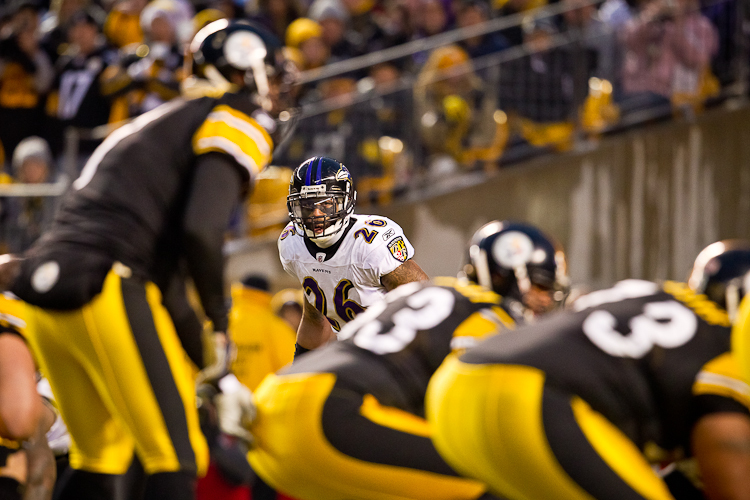 When you move up to a higher vantage point all that stuff goes away and you are left with the two best elements…the players and the field. 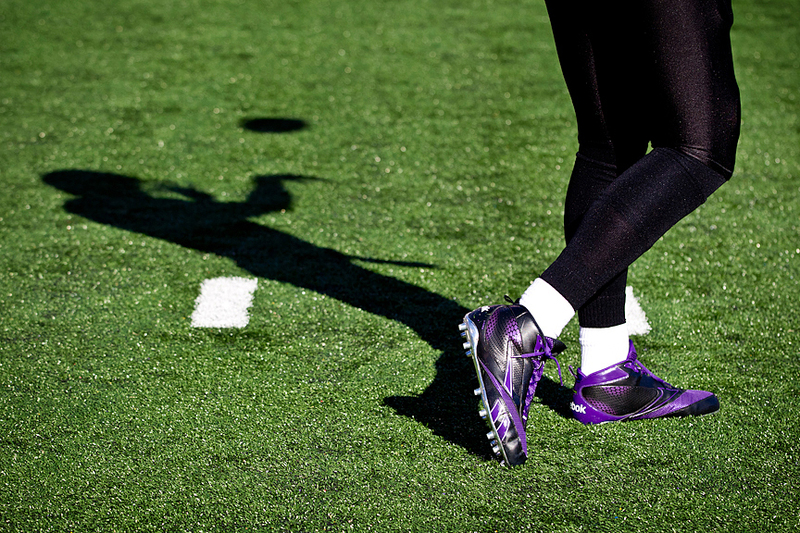 So simple, and totally my style. 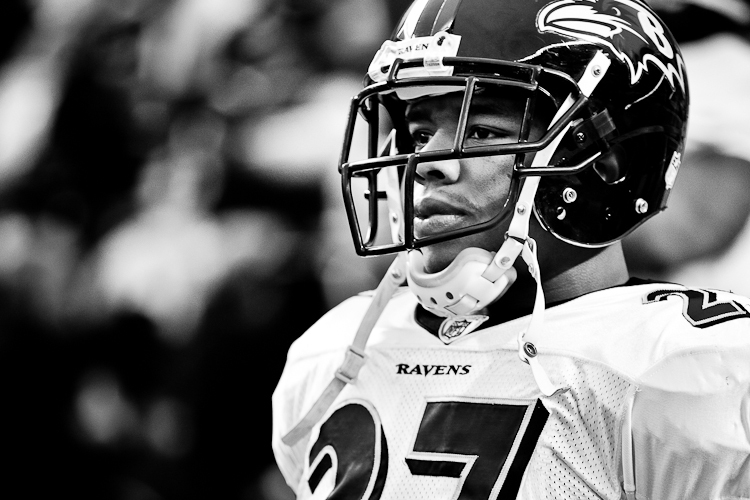 Aside from that, I’m looking forward to my trip with the team to Kansas City. 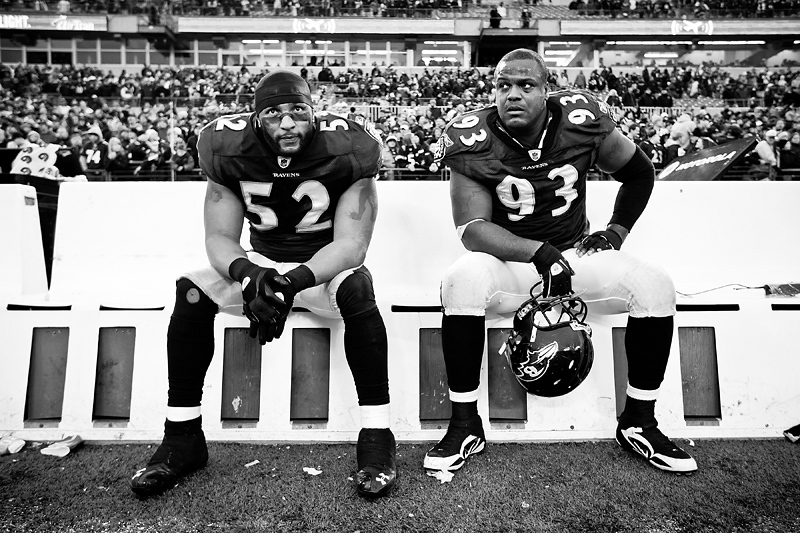 Traveling with the Ravens is always an interesting experience. 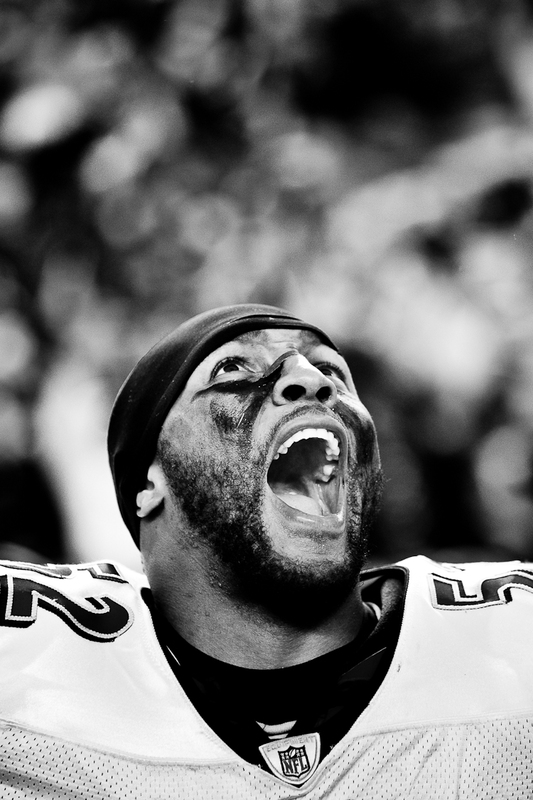 I’ve never shot at Arrowhead and I hear its going to be cold and loud….sounds like fun to me!